The Editor is thrilled to present a BONUS Revision Week interview . 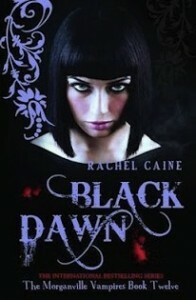 . . with Rachel Caine! 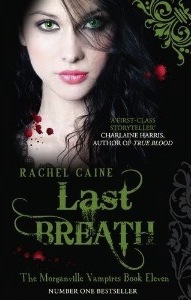 Rachel is the New York Times, USA Today, and internationally bestselling author of more than 30 novels, including the YA series The Morganville Vampires, the Weather Warden series, and the Outcast Season series. 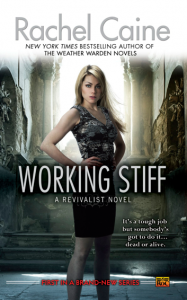 Rachel’s newest series, The Revivalist, launched in 2011 with Working Stiff, and her stand-alone YA novel The Great and Lamentable Tragedie releases this year. Please join Rachel and The Editor for the Revision Week finale, and find out how to win the final “Free Partial Edit” from The Editor. Rachel Caine has been honored with a Paranormal Pearl Award and an RT Booklovers Award, and was recently awarded a Career Achievement Award from Romantic Times. She has appeared as a guest at over 100 science fiction, fantasy, mystery and romance conventions and conferences over the past 20 years, including Dragon*Con, San Diego ComicCon, the World Fantasy Convention, and the World Science Fiction Convention. Rachel has been featured in several national publications including People magazine, Entertainment Weekly, and Vanity Fair, and on international, national, and local television and radio. Today Rachel talks about revising when you’re under the gun. *After Rachel’s interview are instructions for entering today’s Free Partial Manuscript Edit Giveaway. Generally, Version 1.5 gets sent in—I may have time for a fast read-through and tweak, but that’s pretty much it. Honestly, under my schedule, there’s no room for them. I’d love to have them, and when I have something that *isn’t* under that fierce spotlight of deadline, I do it. Generally, my agent (fellow author Lucienne Diver) also reads my manuscripts and gives me feedback while the editor is reviewing it as well, so I have additional input. I have nothing against critique partners, and have been a member of several groups, but it’s a timing issue now. Oh, yes. I just finished copyedits for that book, Two Weeks’ Notice (Book 2 in the Revivalist series). My original first draft was solid, but it had a huge plot hole—I specifically said that a certain virus took a month to incubate and become active, and then I had it happening almost immediately to a second character. That seems like an easy fix, but what the second character did under the influence of the virus was critical … and it seemed like a dead end, because I needed that one-month incubation period for story purposes. I solved it by realizing that what the second character did could be transferred to a third, unrelated character who could plausibly have been infected a month before. And it worked! I once cut out half the book. HALF. Just took everything that happened after the “broken” scene and started over from scratch, because that scene was pivotal and everything after followed the wrong trail. It was difficult, but it worked in the end. There’s never a final draft for me, only the one you have to turn in because you’re out of time. But I guess if I had the luxury of having all the time in the world to do it, I think it would be the point at which I was bored with the story, where I didn’t want to play in that world anymore. There’s a certain fatigue that sets in, and I think if you’re reworking past that point, you’re not helping the story. Deadline: MIDNIGHT tonight, March 11, 2012, PST. Winner will be randomly selected using Randomizer.org and announced on March 12, 2012, in the DearEditor.com comments section and on the DearEditor.com Facebook page, and the winner will be notified directly via email. Good luck . . . and thank you for a fun week! Congratulations to Patricia Miller, winner of yesterday’s Free Full Manuscript Edit giveaway. Patricia, I’ll contact you direct via email. Everybody, good luck on the last Revision Week giveaway today! Thank you SO much! I’m very happy to have won. Wow! That is so impressive that you can get your work done so quickly. I am envious! Thanks for the interview. I really don’t consider revision “a luxury” because no one would take my writing seriously without it. As much as I wish it were different, I’m just the kind of writer the has to start rough and work until it shines, so I hope there are still agents who can accept that. Rachel, I get why you have to work this way, but I’d drive myself batty at that pace, but I know writers further along than me who work this way, and to great success, so you’re in good company. While I know you say this out of the honesty in your circumstance, and that you don’t say it’s at all easy (I imagine it’s not) but I do not work well that way, and trust me, I’ve tried countless times in the last nine years. I don’t need a tight deadline to know where I dawdle and what I don’t do so well, but it doesn’t mean any given story’s ready when I want it to be. You’d think I’d have it easier because no one’s putting me on deadline to just “take all the time in the world” but it doesn’t feel luxurious in my case. It can be trying because I feel like I’ll never achieve certain goals for myself if everything I work on takes months or even YEARS to be where they need to be. But I need to calm down and remember that my path is not the same as another’s, doesn’t mean it’s better or worse, and to honor my accomplishments without comparing to others. Still, writers like you sure make me feel old, and I’m not even 30 yet. Just need to remember what I posted yesterday, because I still stand by it, but you have my deepest respect for doing what you need to do for you to keep commitments to others and yourself. I love that this week has revealed different styles and paces for revision. Some fast, some slow, but each just right. I find it particularly fascinating that revising style/pace can vary for each writer depending on the stories themselves. Some stories take months to write and revise, others take years. I’ve experienced that phenomenon myself. I’m surprised at the pace Rachel needs to keep up. She’s one hard-working lady. Thanks so much for the week of interviews and generous giveaways, Deborah. And congrats to all the lucky winners! It was great to hear from one of my favorite authors! I love the Morganville series. Loved hearing how the plot hole problem was resolved–that was a creative solution. Thanks for a great week of interviews and prizes. Congratulations to the winners! Thanks so much, Deborah, and to all of your guest! I can’t imagine being able to complete a novel in three months. Wow! My hats off to this incredible woman, Rachel Caine, with her prolific abilities! And I am so very grateful to Deborah for this entire week of eye-opening, insightful revision advice from writers of such stature in the literary world. I am in awe and inspired. Thank you! You’re so welcome, Jacqueline… and everybody. I’m thrilled to know that so many readers have gained so much from this week, and I’m honored that these wonderful writers have taken the time to pull back the curtains for us. I’ve enjoyed myself immensely. I absolutely will make this an annual event! Looking forward to this annual event! It was altogether fascinating, interesting and enlightening! I have *loved* revision week and getting to know the inner workings of the great and diverse group of authors you’ve interviewed. THANK YOU Deborah and DearEditor.com!